Don’t you love the new library catalogue? A pleasure to operate, isn’t it? With difficulty, one can use it. But it borders on terrible. You know it, I know it, the Web team knows it. They as much as admit the failings of the system on the TPL Webteam blog, which you might want to read or subscribe to. (Check developer Dara Renton’s workstation.) You can just feel the writers holding back from saying what they really think. They’re the ones who have to live with it day in and day out. 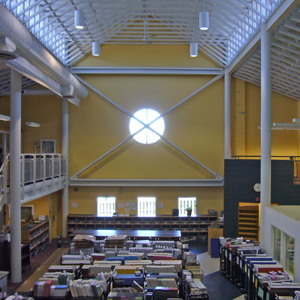 However, before you storm the Reference Library with flaming pitchforks, understand that there are very few vendors of software for library catalogues and even fewer that can handle what is reputed to be the world’s largest public library. They’re kind of stuck, which means we are too. On the plus side, the new computers that are being installed in branches have finally, at long last, gotten rid of the worst browser ever created, IE6, replacing it with IE7 and Firefox. (Both!) Real sites now look more or less correct, and you as a library patron may join the 21st century and use tabbed browsing to watch your Farsi videos and old episodes of Happy Days . 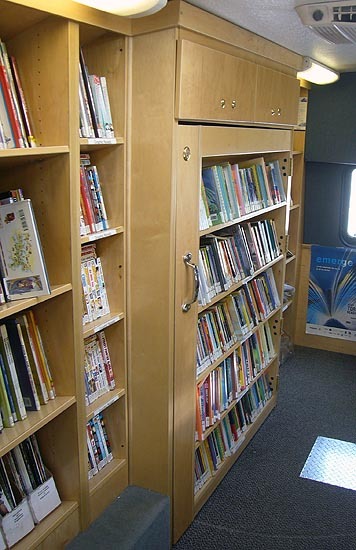 Does the idea of a bookmobile in a “rich” city that already has 99 library branches strike you as an anachronism? If so, you must not have visited one. The library’s bookmobiles are the single most wondrous and charming feature of Toronto I’ve set eyes on in my 20 years here. Yes, they’re that good. And we’ve got two of them. Last Sunday I schlepped out to East York Town Centre (not Civic Centre) on Overlea Blvd. to visit Bookmobile Two, parked at the edge of the lot alongside some kind of sinister fairground attraction that looks like it’s coiled and ready to strike. Books and magazines for grownups and kids. The magazines were kind of old and stale that day, and they were mostly wymmynz titles like Cosmo Girl . 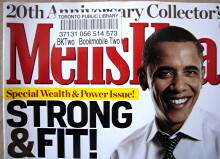 Still, I snagged what could be the only issue of Men’s Health in living memory featuring a cover model wearing a shirt. Piles and piles of comic books. Magazines in Chinese, Russian, Spanish, Vietnamese, and Tamil. A couple of seats (people do sit there and read). Pretty much anything you can do at a library branch you can do here. 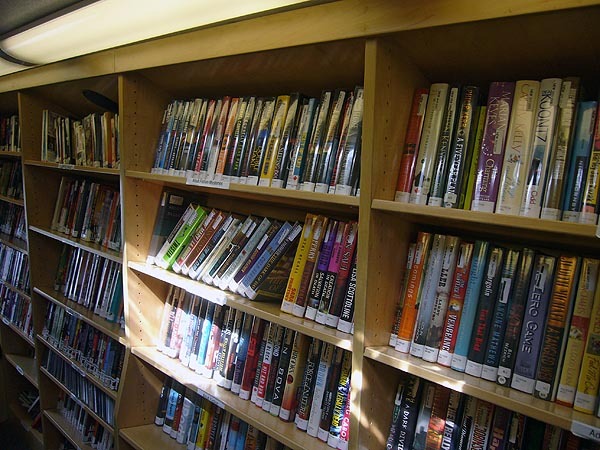 You can check out and return books (done on a Windows laptop with a wireless card – it’s connected to the network in real time). The bookmobiles sleep in an underground garage at Mel Lastman Square. North York Central Library is their headquarters, with their own little office, apparently. TPL’s plan is for pretty much everybody in the city to be within a kilometre of a library branch. Not everybody is, of course. Now, maybe eventually every little gap in the city will be filled with branches, but for now the bookmobile is a cheap way to provide basic library service. The Thorncliffe branch near this parking lot is under renovation, so Bookmobile Two visits this pocket of East York twice a week. 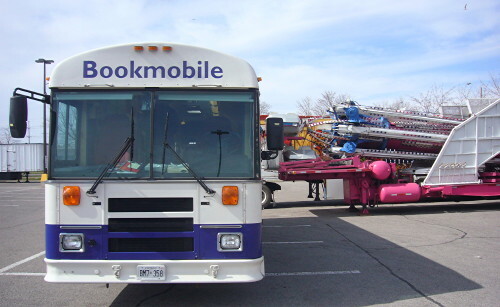 But the bookmobiles drive all over the place – way up to Steeles Ave. sometimes. How do they avoid a Lucille Ball/ Long Long Trailer scenario with books flying onto the floor whenever they race around a curve like in a cop show on TV? I thought they had to have netting or bungee cords or something, but nope: The angle of the shelves takes care of it. I figured that the lock and handle on one of the shelves had something to do with securing the cargo. Boy, was I wrong. 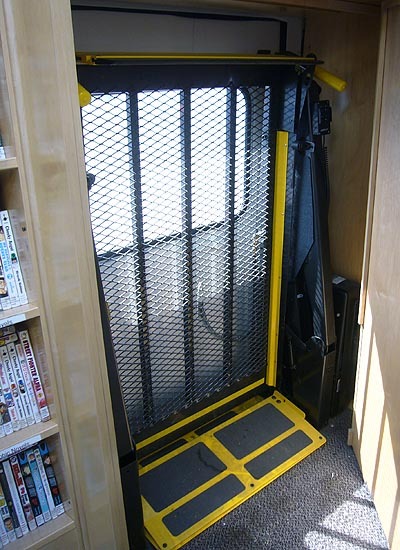 The library bills these buses as being wheelchair accessible. You can see a cutout for a lift of some kind on the outside, but where the heck is it on the inside? It’s hidden behind a trap door. See that lock and handle? It’s straight out of Agatha Christie! Seriously, why can’t there just be a certain leather-bound volume you pull out to open the door and reveal the chairlift? Has this charmed your pants off yet? Well, it should. They thought of everything. 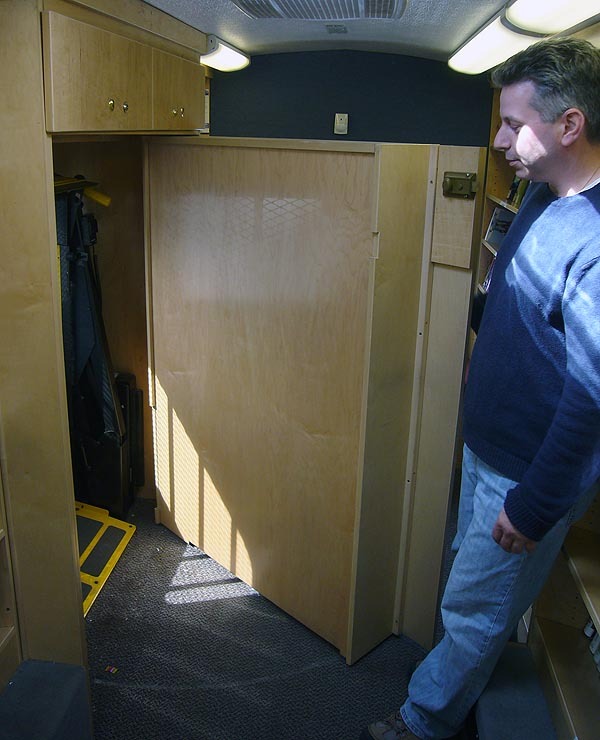 The bookmobile is like a really well thought out New York apartment: Everything you need, sometimes slightly smaller than you’re used to, in exactly the right place with nothing wasted. If you’re sensitive to these things, you can get a feeling of excellence of design. The library’s recently-renovated branches are justly celebrated for such a quality, but these tiny bookmobiles also have it in spades. Then there’s the people. You know, the reason we’re doing all this. I stood around and had a lovely chat with the shy librarian, Gary. (The even-shyer page kept to herself.) He’s been doing this for ten years (“I’m one of the newbies”) and also works on the Home Library Service, which delivers books to seriously ill or disabled people who can’t get out of the house. This takes a certain gentleness and sensitivity, which seemed readily apparent. I ended up closing the place (like being the last one out of a bar), and in the hour or so I spent there, only a couple of adults came in by themselves. Everyone else was moms and kids, seemingly all of them Indic (with lots of intermingling of languages within and between sentences). They were obviously regulars and it was obviously a big deal for them. And the kids were almost jumping with joy at being there. You know all those articles you read about how kids don’t like to read articles, let alone books? How literacy is declining and so on? This doesn’t make a lot of sense in the face of blogs, Facebook, and Twitter, so we know that part of the problem is that pundits expect children to typewrite school essays on classics of literature at the age of ten. They’re looking for literacy in yesterday’s places. And Gary tells me that many other stops serve mostly seniors. Fine. Your tax dollars at work. And worth every penny. One of the vehicles in this photograph is the subject of a superexclusive upcoming posting on TPLFans. Hint: It isn’t the pink one. Yes, I have a few complaints. Why is it so hard to get out of the Reference Library if you’re holding any kind of book whatsoever? In theory they have to check your bags. In practice they just glance at your bag. If I have a book from another branch, I hand it to them and say “From another branch.” The worst-case scenario, so unpleasant that I actually avoid it, is to try to leave TRL with a book from TRL that you had previously checked out. They make you walk back to the checkout desk and get another receipt. Now, really: Aren’t thieves the least likely to subject themselves to that degree of inspection? And isn’t this security theatre in the first place, since the most likely form of theft is a stolen picture or a page ripped out of a book, not an actual stolen book? Why is it so hard to get out of the North York Central Library if you’re carrying anything, at all, from any other branch? Everything from that branch has to be handed around the gate, because they never desensitize the anti-theft strip. So they check out your items and pass them around. Fine. 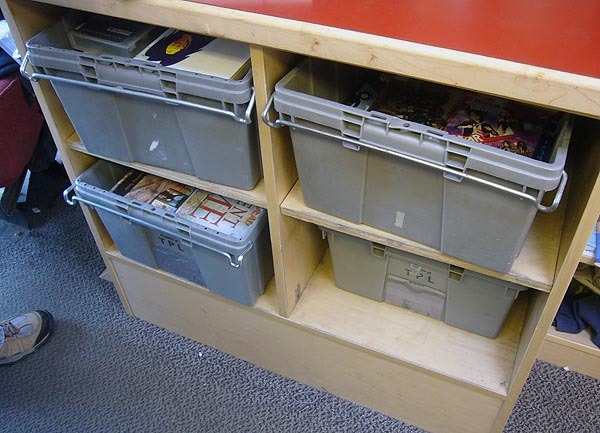 What do they do with other library materials? The worst case: Make you stand there as they look over the entire list of items you have out, which is none of their damned business in the first place, in an effort to find the item on the list. I think they’re just pretending: I don’t think they actually manage to find it half the time, especially for customers like me who have 15 to 30 items out at any given time. The best case (it’s happened once): They just check it out again. Nothing happens if it’s already checked out. Why do some design magazines circulate at North York CL and some don’t? They’re comparably expensive. I shouldn’t mention this, I suppose, because somebody will equalize the system so that nothing circulates. If they’re going to equalize anything when it comes to periodicals, how about lagtime before a new periodical circulates? I know several branches that circulate them immediately on receipt. Others make you wait until the day they expect to receive the next issue (often a wonky guess). But City Hall won’t let you take out the second-latest issue if its circulation date has not arrived yet and they also have the very latest issue. 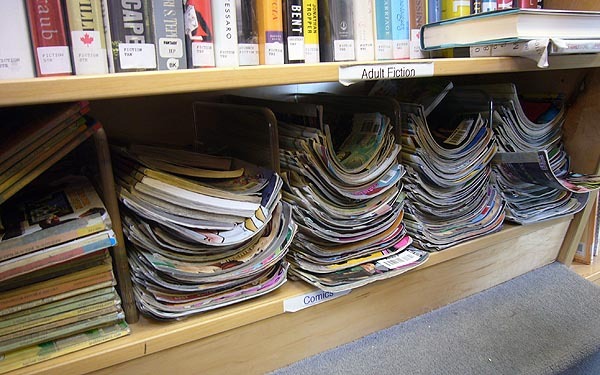 Circulation on receipt is best for the at-home reader; delayed circulation is best for the in-branch reader. The City Hall policy needs to be reversed. Why are there almost no comedy CDs in the collection? Literally almost none. Check any comedians you like, from George Carlin to Katt Williams. They aren’t there. All audiobooks together. Don’t file nonfiction audiobooks with nonfiction books (as at Jones). It’s great we’re opening more libraries on Sundays, but why aren’t we opening more of them on Mondays?